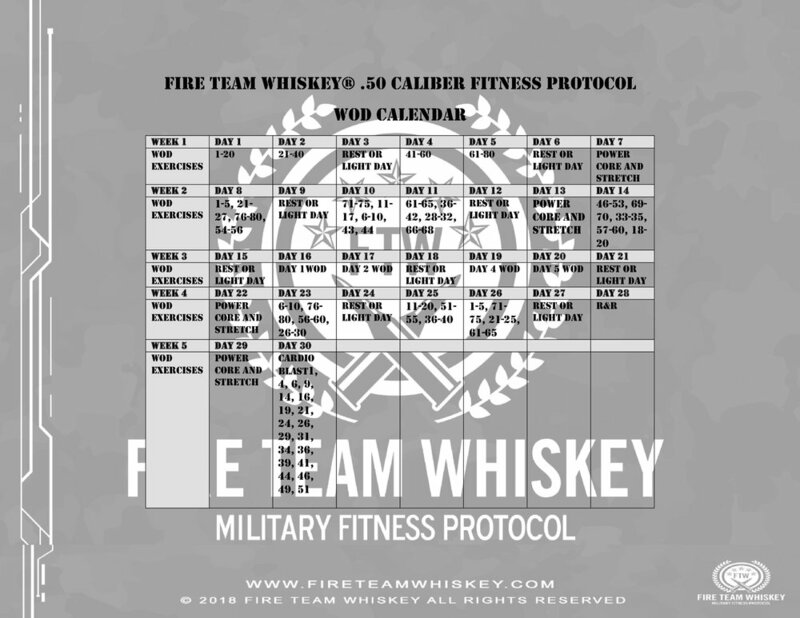 The Fire Team Whiskey® .50 Caliber Fitness Plan is designed to be the third step on the journey to optimal fitness. 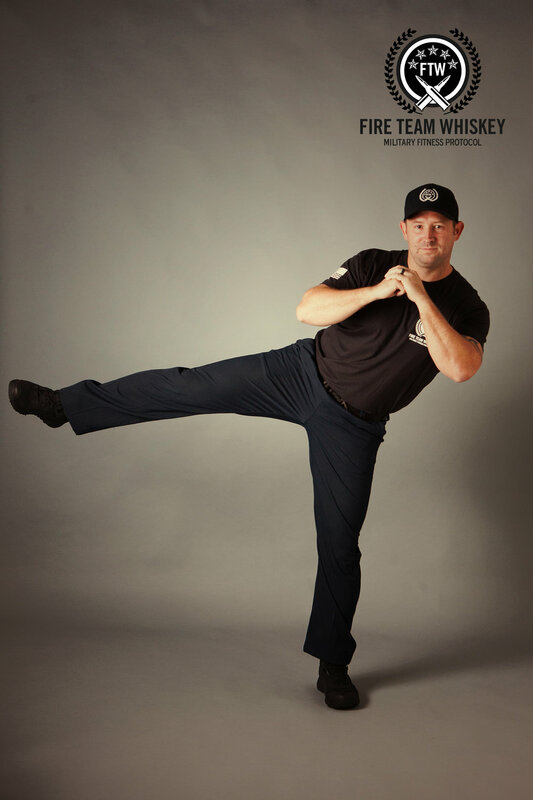 In the .22 CAL Fitness Program, you were introduced to the concept of high intensity interval body weight exercise. The .38 Caliber Fitness Plan followed the same theme of high-intensity interval workouts, but with the addition of another component of fitness: agility and coordination. The .50 CAL fitness protocol follows the same theme of high intensity interval, complex, multi functional movements, but we introduce the use of a resistance band. This allows for an additional level of strength training being added to your body weight strength training that you have already been doing with the .22 and .38 CAL fitness programs. The exercises are still done in short duration with short breaks but performed at maximum effort. It is critical to work as hard as you can during the exercise timeframe. Taking longer breaks, or only working at minimum effort will not get you the results you want. The benefit of high-intensity intervals is that they are short, so you can work extremely hard for that short amount of time without the need for “conservation of energy” that longer endurance exercise requires. Each Caliber Fitness Plan is designed for a 30-day duration, at which point, you will either graduate to the next Caliber Fitness Plan or continue with the current plan until Caliber goals are met. The next section of this site contains the .50 Caliber Fitness Plan. Your dog tag USB and member site contains demonstration videos for each exercise. Take the time to watch these demo videos and observe the proper form and modifications if you need them. Each exercise demonstration provides guidelines for proper form, time interval and reps and recommendations for modifications and progressions. Your .50 Cal membersite has all the WOD videos if you should want to follow along with the WOD. A suggested WOD timer is also on your .50 CAL member site, but you can use any timer you would like. You may complete your own warmup and cooldown exercise stretching routine if you prefer. Exercise within your individual fitness and medical limitations. If you have a question about a modification or substitution for any of the exercises, please contact the Fire Team Whiskey Cadre. They can help. The .50 Cal Base and Battle Buddy Package come with a WOD Fitter band, but if you are looking to purchase additional bands to have options in resistance, here is a direct link to their page. Each warmup and cooldown exercise is suggested to be 30 seconds in duration. There are three warmup and cooldown exercises. The warmup is one minute and 30 seconds in duration. If this is not long enough, you may extend your warmup for as long as you need in order for you to feel warm enough to begin your high-intensity interval training. The same guidance goes for the cooldown period. You may extend it for as long as you feel necessary to have stretched enough and reduced your heart rate down enough for recovery. The .50 Caliber WODs consist of 20 exercises @ 30 seconds each with 15 second transition time for 2 rounds. Work at max rate for each exercise. 2 Rounds. Each WOD is a total 30 minutes workout time plus 6 minutes for warm up and cool down. 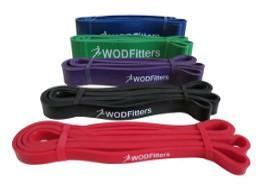 The .50 Cal WODs are a mix of Cardio, Core, and resistance band strength training exercises. Below is a 30-day calendar with the .50 Caliber Fitness Plan. This provides you a WOD for each day and intermittent rest days. This calendar is a guidance and not set in stone. We suggest that if you do not follow the calendar, that you complete three cardio and three strength workouts for at least 30 minutes in duration a week at a minimum (the Caliber WODs counting as the cardio days).